Li Ning, a former Chinese gymnast, lit the Olympic cauldron during the opening ceremony of the 2008 Summer Olympics. The tradition of carrying the Olympic flame from Olympia, Greece, the birthplace of the Ancient Olympic Games, to the host city of the modern Olympic Games via a torch relay was first introduced in 1936, ahead of the Berlin Games. Since then, famous athletes (active or retired) with significant sporting achievements while representing the host country, promising young athletes, or other individuals with symbolic significance, have been selected as the last runners in the Olympic torch relay and consequently have the honor of lighting the Olympic cauldron at the opening ceremony. 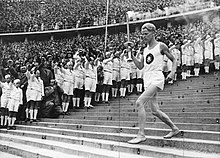 The first well-known athlete to light the cauldron was nine-time Olympic champion Paavo Nurmi at the 1952 Summer Olympics in Helsinki. Other famous final torch bearers include French football star Michel Platini (1992), heavyweight boxing champion Muhammad Ali (1996), Australian sprinter Cathy Freeman (2000), the Canadian ice hockey player Wayne Gretzky (2010), the marathon runner Vanderlei Cordeiro de Lima (2016) and the South Korean figure skating champion Yuna Kim (2018). On other occasions, the people who lit the cauldron were not famous but nevertheless symbolized the Olympic ideals. Japanese runner Yoshinori Sakai was born in Hiroshima on August 6, 1945, the day the city was destroyed by an atomic bomb. He symbolized the rebirth of Japan after the Second World War when he lit the Olympic cauldron of the 1964 Summer Olympics. At the 1976 Games in Montreal, two teenagers—representing the French- and the English-speaking parts of the country—symbolized the unity of Canada. Norway's Crown Prince Haakon lit the cauldron of the 1994 Winter Olympics, in honor of his father and grandfather, both Olympians. For the 2012 Games in London, seven aspiring young athletes—each nominated by a former British Olympic champion—had the honor of lighting the cauldron. Fritz Schilgen carrying the Olympic torch down the steps of the Olympic Stadium in Berlin, 1936. John Mark, the final torchbearer at Wembley Stadium in London, 1948. Paavo Nurmi lighting the cauldron in Helsinki Olympic Stadium, 1952. Yoshinori Sakai on the way to lit the cauldron at National Stadium in Tokyo, 1964. Norma Enriqueta Basilio, the first woman to light the cauldron, at the Estadio Universitario in Mexico City, 1968. Sandra Henderson and Stéphane Préfontaine, representing French and English Canada, lights the cauldron in Montreal, 1976. Basketball player Sergei Belov lighting the Olympic fire at the Luzhniki Stadium, Moscow, 1980. 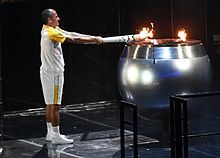 Vanderlei Cordeiro de Lima, Brazilian marathonist lighting the cauldron in Maracanã Stadium, Rio de Janeiro, 2016. Basketball Le May Doan was a winner of two gold medals in the 500 m in 1998 and 2002 and a bronze in the 1000 m in 1998. Nash is a two-time NBA MVP with the Phoenix Suns and a former member of the Canadian Olympic Basketball team, playing in 2000 Summer Games. Greene won gold in the giant slalom and silver in the slalom in 1968 Winter Games. Gretzky was a member of the Canadian ice hockey team and won four Stanley Cup titles as captain of the Edmonton Oilers (1984, 1985, 1987, 1988). He was the Executive Director of the Canadian men's hockey team in 2002, who won gold at that Games. During the opening ceremony, Nash, Greene and Gretzky lit a cauldron inside the BC Place indoor stadium. Gretzky then lit a second, outdoor cauldron near the Vancouver Convention Centre. Only the outdoor cauldron remained lit throughout the Games. Le May Doan was supposed to participate in the lighting of the indoor cauldron, but was left out when one of the four arms failed to raise due to mechanical problems. This was corrected at the beginning of the closing ceremony, when a joke was made about the mechanical error, and she was able to light the newly emerged fourth arm and relight the indoor cauldron to begin the closing ceremony. Track and field The cauldron was lit by seven teenagers, each nominated by a veteran British Olympian: Airlie was nominated by Shirley Robertson, Duckitt by Duncan Goodhew, Henry by Daley Thompson, Kirk by Dame Mary Peters, MacRitchie by Sir Steve Redgrave, Reynolds by Lynn Davies and Tracey by Dame Kelly Holmes. Austin Playfoot later relit the cauldron in its new spot in the Olympic Stadium. Duckitt was the only non-athlete among them. Henry would later go on to win an Olympic bronze medal in the 4 × 100 m in 2016. A second, outdoor cauldron was lit in front of Candelaria Church by 14-year-old, who was part of a sports project in Rio de Janeiro. 2010 Summer Youth Singapore Darren Choy Sailing A Singaporean sailor of who participated in the Games. 2012 Winter Youth Innsbruck Egon Zimmermann Alpine skiing Both Zimmerman and Klammer won the gold in the downhill event in 1964 and 1976 respectively, both years when Austria previously hosted the Adult Winter Games. 2014 Summer Youth Nanjing Chen Ruolin Diving Winner of back-to-back gold medals in diving in 2008 and 2012 Adult Summer Games, in the 10 m and the 10 m synchronized. She would retain the latter's gold medal in 2016 Adult Summer Games. ^ "Berlin 1936". Olympic.org. Retrieved 2 October 2018. ^ "London 1948". Olympic.org. Retrieved 2 October 2018. ^ "Oslo 1952". Olympic.org. Retrieved 2 October 2018. ^ "Helsinki 1952". Olympic.org. Retrieved 2 October 2018. ^ "Cortina d'Ampezzo 1956". Olympic.org. Retrieved 2 October 2018. ^ "Melbourne – Stockholm 1956". Olympic.org. Retrieved 2 October 2018. ^ "Squaw Valley 1960". Olympic.org. Retrieved 2 October 2018. ^ "Rome 1960". Olympic.org. Retrieved 2 October 2018. ^ "Innsbruck 1964". Olympic.org. Retrieved 2 October 2018. ^ "Tokyo 1964". Olympic.org. Retrieved 2 October 2018. ^ "Grenoble 1968". Olympic.org. Retrieved 2 October 2018. ^ "Mexico 1968". Olympic.org. Retrieved 2 October 2018. ^ "Winter Olympics Open In Splendor at Sapporo". nytimes.com. The New York Times. 3 February 1972. Retrieved 2 October 2018. ^ "Sapporo 1972". Olympic.org. Retrieved 2 October 2018. ^ "Munich 1972". Olympic.org. Retrieved 2 October 2018. ^ "Innsbruck 1976". Olympic.org. Retrieved 3 October 2018. ^ "Montreal 1976". Olympic.org. Retrieved 3 October 2018. ^ "Lake Placid 1980". Olympic.org. Retrieved 3 October 2018. ^ "Moscow 1980". Olympic.org. Retrieved 3 October 2018. ^ "Sarajevo 1984". Olympic.org. Retrieved 3 October 2018. ^ "Los Angeles 1984". Olympic.org. Retrieved 3 October 2018. ^ "Calgary 1988". Olympic.org. Retrieved 3 October 2018. ^ "Seoul 1988". Olympic.org. Retrieved 3 October 2018. ^ "Albertville 1992". Olympic.org. Retrieved 3 October 2018. ^ "Barcelona 1992". Olympic.org. Retrieved 3 October 2018. ^ "Lillehammer 1994". Olympic.org. Retrieved 3 October 2018. ^ "Atlanta 1996". Olympic.org. Retrieved 3 October 2018. ^ "Nagano 1998". Olympic.org. Retrieved 3 October 2018. ^ "Sydney 2000". Olympic.org. Retrieved 3 October 2018. ^ "Salt Lake City 2002". Olympic.org. Retrieved 3 October 2018. ^ "Athens 2004". Olympic.org. Retrieved 3 October 2018. ^ "Turin 2006". Olympic.org. Retrieved 3 October 2018. ^ "Beijing 2008". Olympic.org. Retrieved 3 October 2018. ^ Friesen, Paul (13 February 2010). "Opening Ceremony timeline". Toronto Sun. Retrieved 13 February 2010. ^ 2010 Winter Olympics opening ceremony (television). NBC Sports. 2010-02-12. ^ Kines, Lindsay (February 28, 2010). "Closing ceremony pokes fun at the 2010 Games". The Montreal Gazette. Retrieved 1 March 2010. ^ "Cauldron moved into position in Olympic Stadium". BBC. 30 July 2012. Retrieved 20 February 2013. ^ "#1YearOn........ Where are they now?". Team GB. 31 July 2013. Retrieved 3 October 2018. ^ Majendie, Matt (26 July 2015). "Rio Olympics 2016: The seven teenagers still carrying a torch for our Games hopes". The Independent. Retrieved 3 October 2018. ^ "Sochi Opening Ceremony: Rodnina, Tretyak light Olympic cauldron together". NBC Sports. 7 February 2014. Retrieved 7 February 2014. ^ "Best man for the job: Vanderlei de Lima lights Olympic cauldron". NBC Sports. 6 August 2016. Retrieved 14 September 2016. ^ "Formerly homeless boy who lit Olympic cauldron now has 'beautiful life'". CBC. 12 August 2016. Retrieved 14 September 2016. ^ "Korean figure skater Kim Yuna lights Olympic cauldron". Yahoo Sports. 9 February 2018. Retrieved 9 February 2018. ^ "Princess Ingrid Alexandra lit the Olympic fire". Norway Today. 12 February 2016. Retrieved 13 February 2016. ^ "THE CAULDRON THAT LIT UP THE HEART OF BUENOS AIRES". Olympic. 7 October 2018. Retrieved 7 October 2018. Wikimedia Commons has media related to Olympic cauldron lighting ceremonies.